Garage Shapeups - Lifetime Epoxy Floors "We make ugly floors beautiful again!" 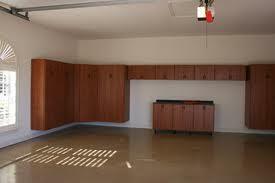 Garage Shapeups LLC's epoxy flooring division is known as Lifetime Epoxy Flooring. Our company has an A+ rating by the North Alabama BBB, a member of The Huntsville/Madison Home Builders Association, and the Huntsville/Madison Chamber of Commerce. Check out these epoxy floor before and after pictures. Our top quality "PIP", poured-in-place epoxy floors do not peel, crack, flake, stain or show hot tire marks. You will not find a better floor. 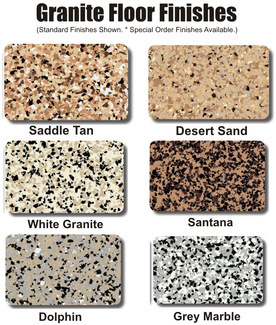 Our floor quality, beauty and durability is a direct result of our documented 5-STEP PROCESS of floor prep and installation. 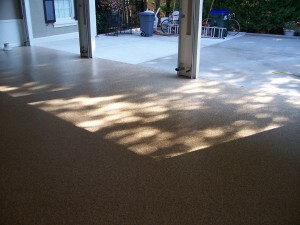 Garage Shapeups has its own flooring division called Lifetime Epoxy Floors. 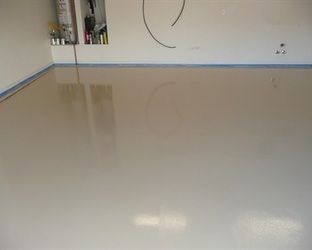 We have highly trained, certified, experienced and committed employees that install top quality floor coatings for residential, commercial and industrial customers. Our epoxy floor coatings and epoxy floor surfaces can be installed in garage in 1 day. Commercial floors and industrial floors understandably take longer depending on the size of the job. We will do your floor right the first time. 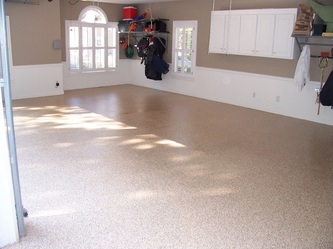 You will never have to buy another epoxy floor unless you add another garage or move! For a Free Estimate call 1-800-214-4311 or fill out this simple & quick Contact Form and submit. Free Estimate - Fill out this quick & simple CONTACT FORM and submit. Attention Homeowners! Make Sure Your Read the Following! Our floor coatings and epoxy floor installation is not what you buy in a box store or in a kit purchased online. Our floors are backed by a LIFETIME WARRANTY because they are professionally installed with the latest technology available. We regular grind up DIY Epoxy Floors every week. 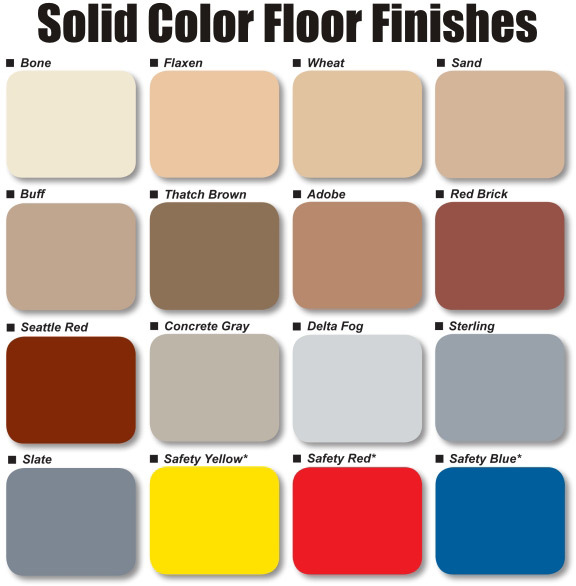 Customers try to save money by buying a cheap kit and either painting the floor down themselves or hiring a painting contractor. The reason that painting contractors do these jobs is that they are basically paint jobs in which a paint with some epoxy resin mixed in is painted on top of your concrete floor surface. The primary reason these floors fail is the fact that they lie on top of the cement rather than becoming embedded into the cement. 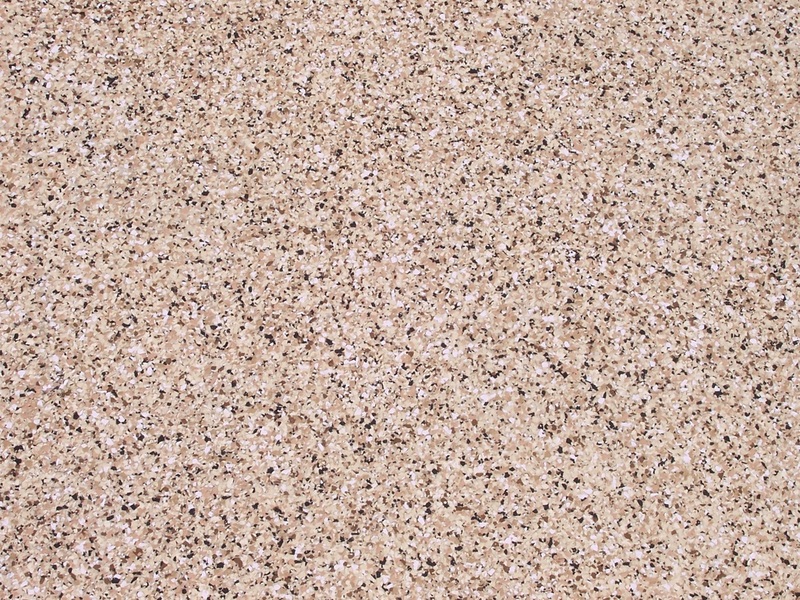 They peel, flake, and crack because they have no embedded "solid-state" bond into the cement. We do not use harmful chemicals and acids to prepare floor surfaces. This protects the environment, your pets and family from being exposure to harmful acids. 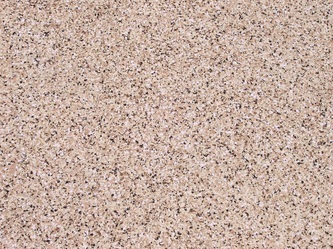 Acids are often used to etch floors in the prep stage by other companies. It reduces labor cost and is a much faster process. We are not about "fast". We are all about Quality! We Do Not Use Acid Prep! We grind every square inch! WE PREP ALL FLOORS MECHANICALLY TO INSURE QUALITY AND A LIFETIME OF PERFORMANCE. We mechanically prepare all floor surfaces the "hard way", using high speed floor grinders equipped with vacuum dust control systems. It is not easy but it is the only way to insure quality! 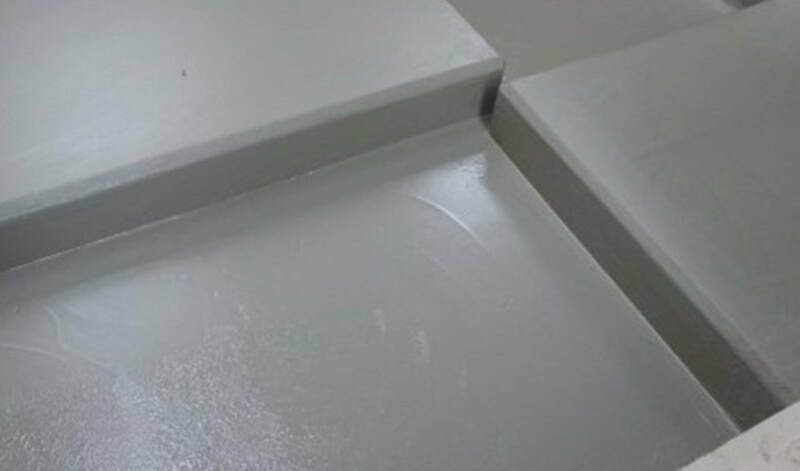 We use the grinders because they open the surface capillaries of the cement surface thus allowing our layers of resin applications to seep into the these open capillaries to form a "solid-state" floor coating boned "as-one" with the cement. This process creates a super durable long lasting floor warrantied for life! 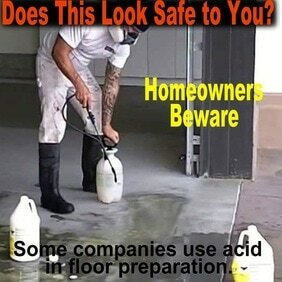 --We do not use acid or harmful chemicals during floor prep. --Petroleum products such as oil and gas wipe off easily. 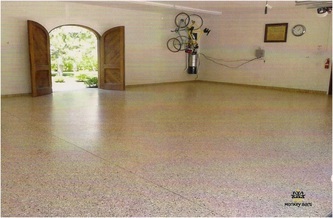 --Garage floor coatings come in solid and textured finishes. 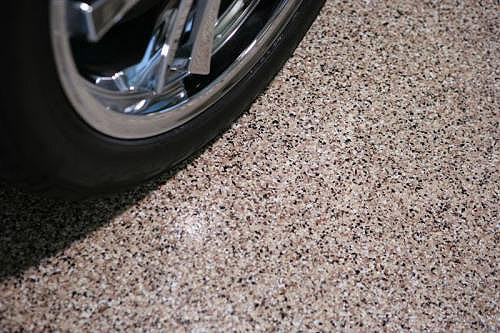 Garage floor coatings come in solid and textured finishes. No need to worry about flaking, chipping, or fading. Remember, we back our floors with a Lifetime Warranty. -- Takes 1 day to apply and set. -- Lasting results with diamond grinding. 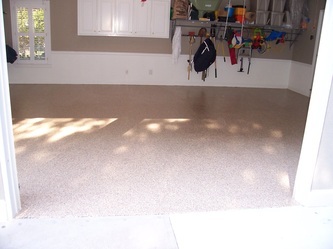 A garage floor coating provides a seamless garage floor. We seal and patch cracks and holes in the concrete prior to application. This is great for preventing bug and dust buildup. 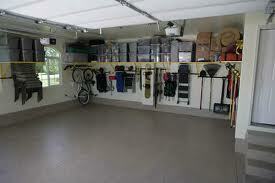 Hose, mop, or sweep your garage in minutes. 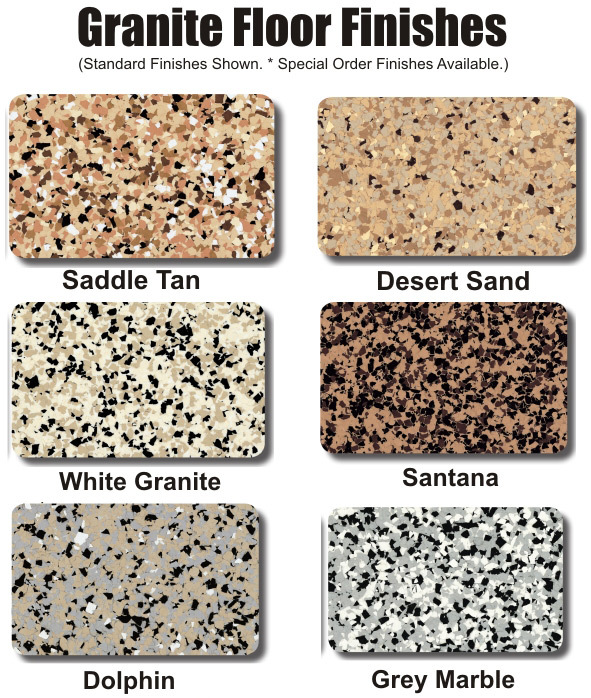 Floor Color: Desert Sand --- This floor had extensive crack repair. What makes the difference in a good garage flooring job and a bad one? It’s the use of a diamond grinding machine to prep the garage concrete floor properly. With other methods like primers/sealers acid etching and paints, you’ll see chipping and flaking. Shortly after an application you’ll have to remove the inferior products and start over. 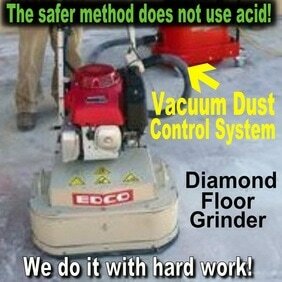 A diamond grinder is the only way to re-profile a garage floor to create a good foundation to adhere to. 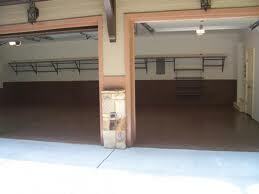 It does this by removing the wear layer and all chemical residues that cause garage floor coatings to fail. 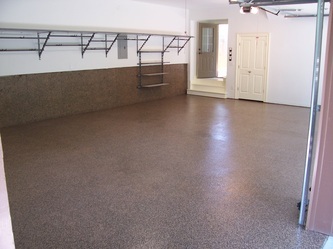 Monkey Bars garage flooring looks even better with an organized garage: Garage Shelving Storage or Garage Overhead Storage. 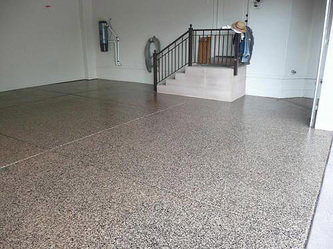 We offer Polyurea Polymer or Epoxy concrete floor coatings.